Today’s manufacturing environment employs some of the most complicated machinery and automated systems in the world. Millat Industries is no different with numerous CNC Machines, Robotic Automation Cells, Special Equipment, and PLC-controlled automation. With these complicated systems comes the great challenge of ensuring their reliability. 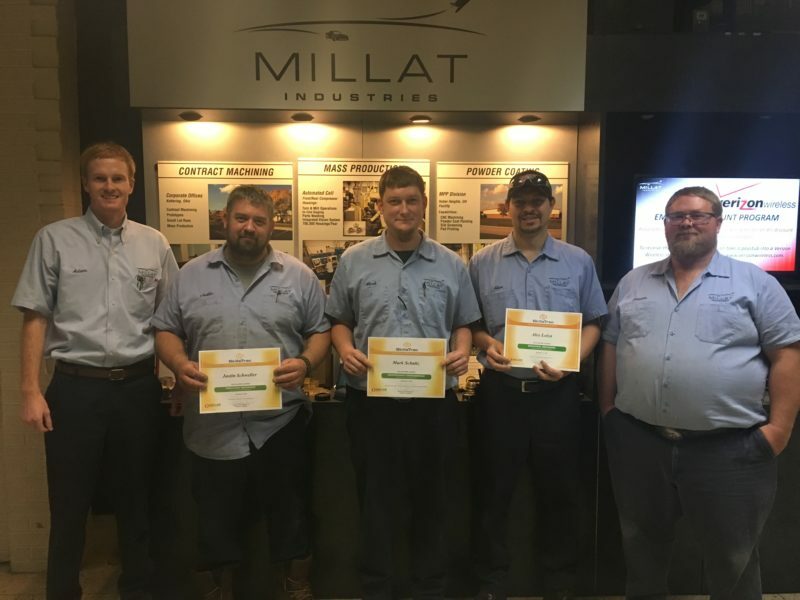 To continually build our competence, three Millat Industries Maintenance Associates have recently completed milestones in the SkillsTrac Program at Sinclair Community College. SkillsTrac is a comprehensive industrial maintenance training program, specially designed for the advanced manufacturing industry. All three associates completed the Green Level, which includes instruction in Maintenance Fundamentals and Industrial Mechanics. Two of the associates also completed the Yellow Level, which includes instruction in Industrial Electricity and Industrial Fluid Power, with the third associate currently in progress. Together, the certificates require over 270 hours of classroom and lab instruction. Equipment reliability directly affects our reliability to our customers and is of utmost importance. Continual improvement of equipment reliability also offers a competitive edge, allowing us to achieve higher throughput across our machinery. Kaizen!